Basically how I’m going about it is eating all raw until dinner, and then for dinner/dessert I’ll eat something cooked or something that’s not necessarily raw if I’m feeling like it. See, I love my roasted sweet potatoes/peanut flour/grain free pizza and since I usually eat these for dinner, it makes sense to keep them in my food rotation. My other meals will stay pretty similar to how they are now —> breakfast will be Sunwarrior/Garden of Life raw protein or chia seed pudding or a green smoothie or raw flax cakes, lunch will be a salad or lettuce wraps or a protein smoothie made with raw protein powder, and my snacks will be banana softserve or snackplates with plenty of fresh produce or homemade raw desserts. What I won’t be doing is restricting my fats or carbs. I personally don’t believe that 80/10/10 is the most balanced way to eat (I love my fruit but I can’t survive on just carbs) and I don’t want to go raw gourmet either because I don’t want to rely so heavily on nuts and avocados for every meal. Instead, I’ll be sticking pretty close to my normal macros (45% carbs, 25% protein, 30% fat) and just incorporating more raw foods. I’m also planning on making plenty of raw dinners as well because I’ve been bookmarking a TON of amazing-looking raw entrees and I’m really excited to try them out. I’m also going to start sprouting legumes and making my own almond milk and I can’t wait to try all these new things! Enough of the wordiness, let’s get to the food. I’ve also got 2 recipes for you today, and another one linked up from my other blog, so I’m going pretty recipe-crazy over here! I’ve been meaning to start doing this for a loooooong time, since there have been a lot of posts and articles out there lately discussing the potential harmful effects of carrageenan and other things added to packaged almond milk. It’s easier than you’d think to whip up your own almond milk at home, especially when you take the cheater’s route like I did. I had some fresh ground raw almond butter on hand and within a few seconds of blending with water, I had homemade almond milk, raw and completely free of unnecessary ingredients! In a large food processor or blender (I used my Ninja processor), add all the ingredients and blend or pulse for a few seconds or until it turns white-ish and creamy. Makes 4 1-cup servings. By now, we all know the outcome of the Superbowl. Even though I’m a fan of the Denver Broncos, being raised in Colorado, I’m not a diehard fan by any means and I honestly didn’t even watch the game so I’m not really upset by their loss. Besides, the Superbowl is just an excuse for snacks, am I right? This year, I made my raw jalapeno poppers (if you haven’t made them and love spicy things, I suggest you do!) and I had one alongside some raw cauliflower, local salsa, spicy guac made fresh at my Whole Foods, spicy sprouted sunflower seeds and a dried fig. This was the perfect snack plate for a spicy food lover like me and I didn’t even care who won the game! My breakfasts have been pretty simple lately, though I’m planning on trying some new things soon. 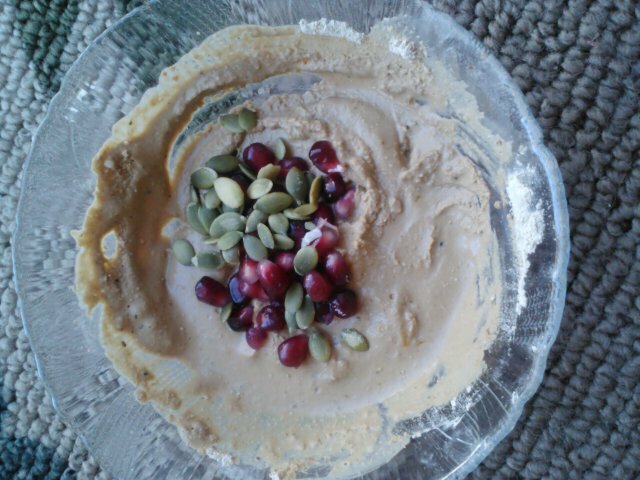 I’ve mostly been making raw protein puddings–Sunwarrior or Garden of Life raw protein powder mixed with water/homemade almond milk and sometimes raw coconut flour to thicken, and topped with pomegranate and raw nuts or seeds. It covers all the macros, tastes great and is beyond easy to whip up in just a minute. 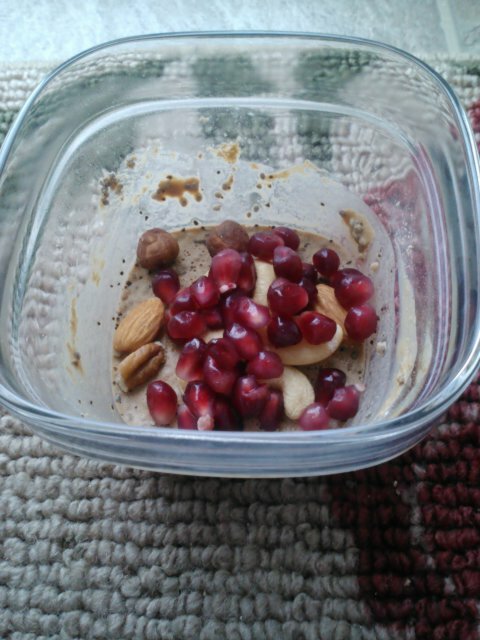 Protein chia pudding topped with pom seeds and raw mixed nuts. Protein-packed chia puddings have been happening for breakfasts and snacks, too. I forgot how much I adore the thick and creamy texture that chia seeds make when they gel up. Honestly, I could eat these all day but it really is all about the toppings and mix ins. The one above was Garden of Life RAW Marley coffee protein powder+homemade almond milk+1/2 tbsp chia seeds and topped in the morning with pom seeds and raw mixed nuts. Sunwarrior vanilla+frozen cherries+homemade almond milk+baby kale+coconut flour smoothie, with a side of raisins and raw mixed nuts. Lunches have been a little bit less predictable. 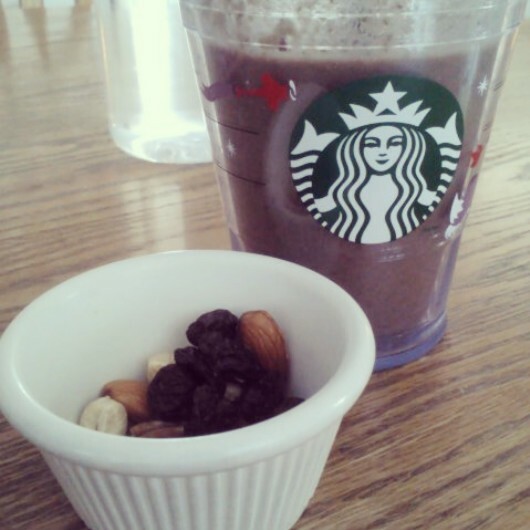 On Monday I had a green protein smoothie with some raw trail mix (just raisins & raw nuts) on the side. Really quick and easy to make and pretty filling, too. I love how eating raw makes food prep so much easier. 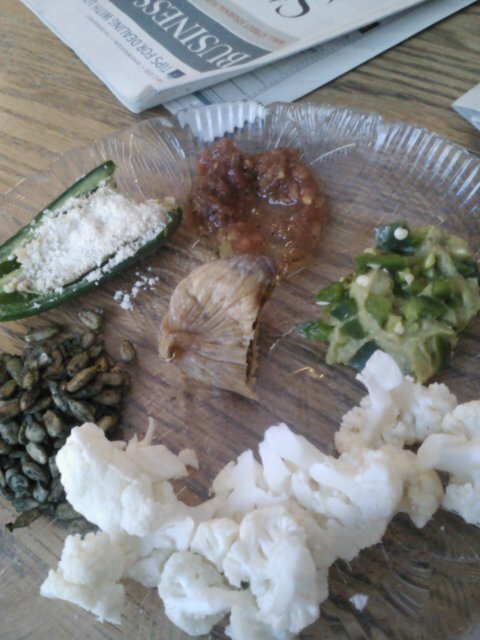 Sure, I’ve been using my dehydrator and food processor a lot but it’s so hands-off and meals come together so quickly. 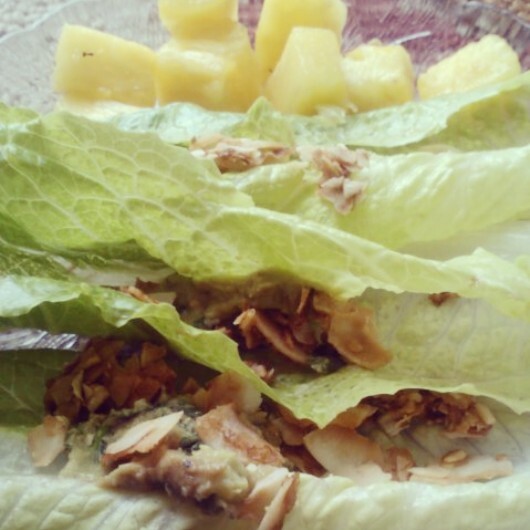 BLA lettuce wraps and pineapple. Romaine hearts+homemade coconut ‘bacon’ and Whole Foods fresh guacamole. Tuesday’s lunch was a little more creative. I made a batch of raw coconut ‘bacon’ in the morning and since I’m basically addicted to it, I decided to incorporate it into my lunch in a creative way. Enter the BLA wraps. The BLA is a spin on the classic BLT, only without the tomato…and avocado in its place. This raw version was incredibly good and I miiiiight have it for lunch again today. 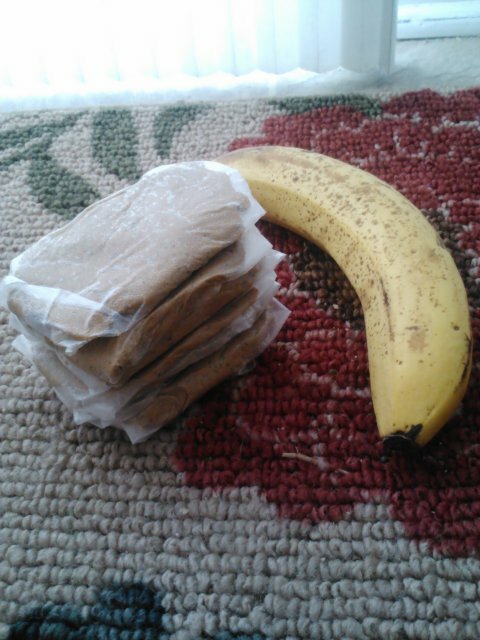 Homemade raw banana protein bars. Going mostly raw has made me more creative in the kitchen! I love that I have so much time to experiment with recipes right now (truth time–I’m still itching to get my first post-grad job!) and I’ve been making a lot of things that I probably wouldn’t normally if I was still eating mostly cooked foods. Like these raw protein bars. I’ve stopped buying Larabars for the time being to save some money and also so I can try making my own raw bars. These are NOT the same consistency as Larabars but I still love ’em…and who says being raw means no protein? I’ve actually been keeping my protein levels up (about 25-30% of my daily macros) during this raw challenge with raw protein powders/nuts/seeds and I’m planning on sprouting lentils soon so stay tuned for that! 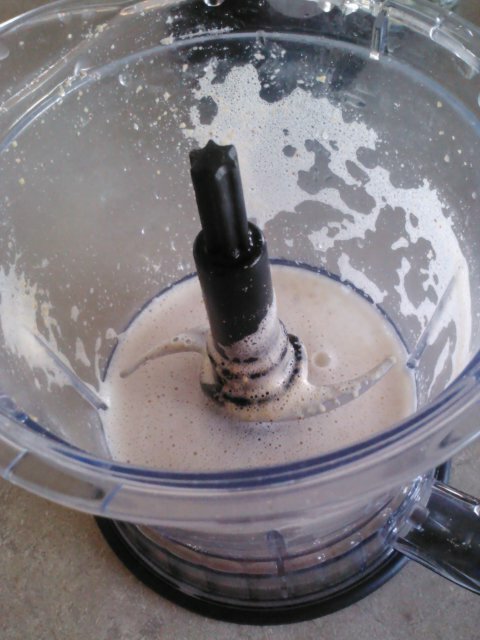 In a food processor or high-powered blender, pulse bananas until smooth and liquefied. Add in remaining ingredients and pulse until combined. Divide into 6 large balls and flatten into bar shapes. Makes 6 bars, ~100 calories and 8 grams protein per bar. 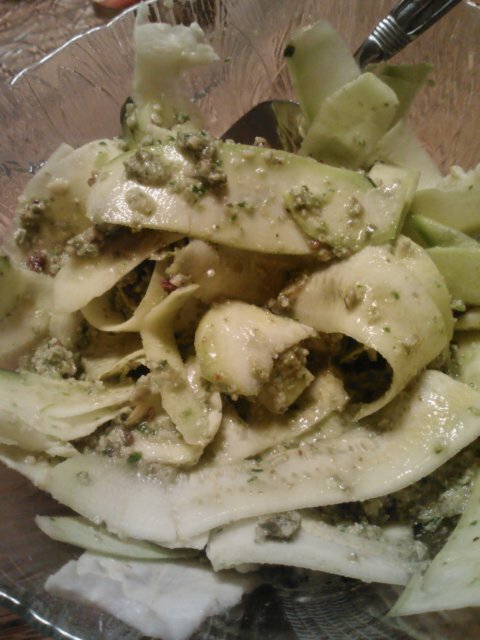 Zucchini pasta and raw pumpkin seed pesto for dinner. So far, my dinners have been raw because that’s what I’ve been craving, even though it’s been snowing here and below freezing! I’ve been making raw pastas with zucchini, carrots and kelp noodles and tossing them in a nut or seed based sauce, pairing it with fruit and calling it dinner. Raw dinners are the simplest things ever, but I’m learning to appreciate simplicity! Do you prefer homemade or store-bought when it comes to bars? Do you like your produce cooked or raw?